There is one thing i love doing when i am on mobile with free data bundle and that is downloading. Visit wapday.com. Wondering what i love downloading? Applications and softwares. I am not the type that love playing games but i certainly love exploration. 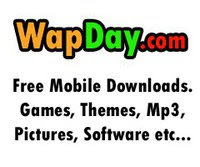 Wapday is another site where you can download free stuffs like music, videos, games, themes etc. Just like most mobile downloading sites, the mobile downloading site is updated daily even with the date stated on it. Wapday also gives it’s users, the ability to choose their phone make and model and items suitable for your device will be suggested to you depending on what you want. How Do I Visit Wapday? Its simple, just visit www.wapday.com and explore a new world of stuffs to download. In my subsequent posts, i will be updating you on more downloading sites. Update: Checking through the website being www.wapday.com, the site seem to have changed from what it used to be. Rather a downloading platform, it seem to be more of an online dating platform. No option to download your favorite games, applications, videos or anything of sort. Considering this change, if you happen to stumble on this post, i highly recommend you check out waptrick here. Waptrick is a highly resourceful platform for your mobile downloads. If your reason for stumbling on this post is with the intent of downloading files online, here are the best Movie apps i recommend for downloading movies. You check out.